The new ATLAS AE938 pull-to-pressure tool for installing blind threaded inserts promotes consistent performance and longer mandrel life in service. The portable tool's pressure-controlled setting allows for installation of the same insert type into various material thicknesses without requiring adjustment and a pull-to-pressure feature helps extend life of the tool's mandrel (standard socket head cap screw). Among other tool features, an auto-reverse mode after fastener installation serves to help accelerate production rates and the tool prevents over-installing or double installing to ensure integrity of fastener threads. The tool is uniquely engineered for reliable installation of steel, brass, aluminum, or stainless steel blind threaded inserts, which provide strong threads in thin panel sections where only one side of a panel is accessible for hardware installation. Access to both sides is not required. The inserts install from the "front" side and enable quick and easy final attachment of components using a single mating screw. 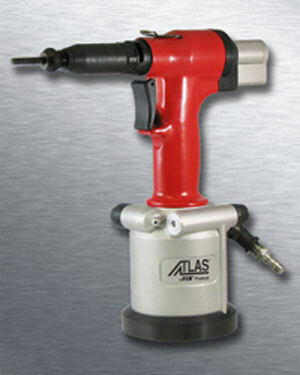 The ATLAS AE938 tool is supplied with gun and unified or metric tooling to install blind threaded inserts from #4-40 through 3/8" or M3 through M10. Tooling also is available on special request to install blind threaded studs from #8-32 through 5/16" or M4 through M8.